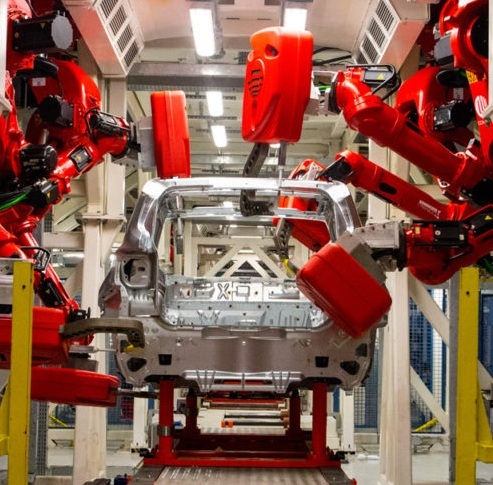 Automotive manufacturing industry is one of the first industries to adopt robotic automation whole heartedly and gradually benefitted from successive developments in robotics technology. In past few years, robots have become smaller, more precise and multi functional, making them important for the automotive manufacturing process. High costs related to the future-generation automotive technology, skilled labors and safety systems fuel the demand for automotive robots to accommodate changeovers in product. Automotive robots are designed to provide cost effectiveness, flexible automation solutions and preciseness of manufacturing process. Furthermore, automotive robots perform welding, material handling, palletizing, assembly and inspection processes in automotive industry. China is the largest car market globally, producing over 24 million units of vehicles. Huge automotive industry of China is largest consumer of robots and accounts for more than 40% of total robot supply. According to international federation of robotics Japan has the highest robot density with 1,276 robot units per 10,000 employees, followed by republic of Korea and USA both with 1,218 units. Wage inflations and price competitiveness in developed countries significantly driving the growth rate of automotive market. Growing automobile sales across the globe and to meet the global demand, automotive industries are adopting automotive robots to increase their production. Moreover, automotive robotics significantly reducing the production cost as it replaces the costly human labor and improves quality. China is the largest car manufacturer globally but lags behind in terms of automotive robot density. Rising wages of labors affecting the price of products, to overcome this China has been introduced industrial plan called 'Made in China 2025' to improve its efficiency and quality of manufacturing which includes implementation of automotive robots, Creating huge growth opportunity for automotive robot market players in China. China is the fastest emerging market which generates a significant impact on the robotics and automation market. India is also one of the fastest growing automotive markets in the region. Big manufacturers in India are spending huge amount on automation of their manufacturing and assembling units to increase their production and to meet growing demand. In 2014, more than 2,100 new robots were installed in India which is 11% more compared to 2013. Automotive industry accounts for more than 70% of robot market in India. However, high initial investment for the installation and high cost related to the maintenance of the automotive robots hinders the growth of Automotive Robotic Market. Asia Pacific automotive robotics market accounted for USD 2.7 billion in 2016 and the market is expected to reach USD 5.8 billion by the end of 2024. Further, the market is anticipated to expand at a compound annual growth rate of 10.1% over the forecast period i.e. 2016-2024. Geographically, China accounted for the highest revenue share in Asia Pacific automotive robotics market in 2016 with more than USD 0.80 billion revenue share. Japan accounts for the second highest revenue share in Asia Pacific region closely followed by India. Automotive manufacturers are highly investing in India to setup new manufacturing units and to develop existing ones. For instance, Maruti Suzuki India Ltd., manufacturing plant in Gurgaon, has at least 1 robot per worker. The manufacturing plant is equipped with more than 2,000 robots for welding and more than 200 robots for paint shop. Singapore and Thailand are also expected to grow significantly owing to growing automobile demand and shortage of labors in Singapore.